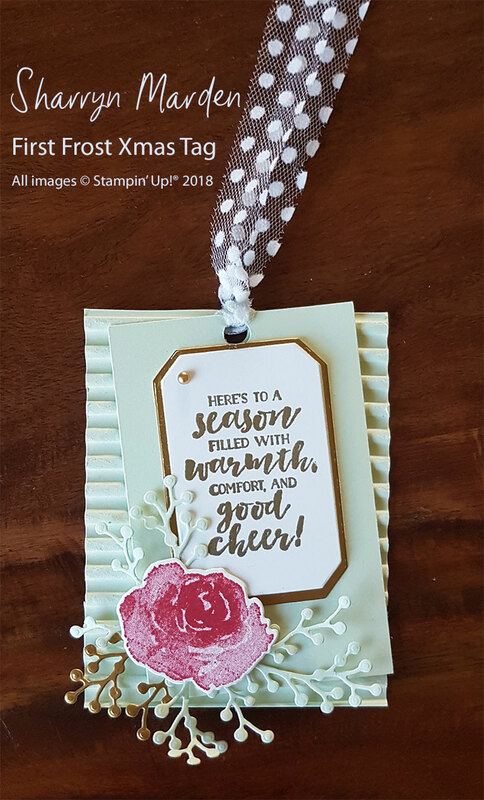 Welcome to my blog on this second Sunday of November … this is Stamping Sunday Second Sunday team’s monthly blog hop hosted by Sara Levin, the Artful Inker. Today we are featuring Gift Packaging ideas using the wonderfully versatile products from Stampin’ Up! I am still at Onstage in Orlando and was not able to get my project done before I left, so my fabulous Inks and Whimsy team members stepped up for me and created some packaging projects for me. 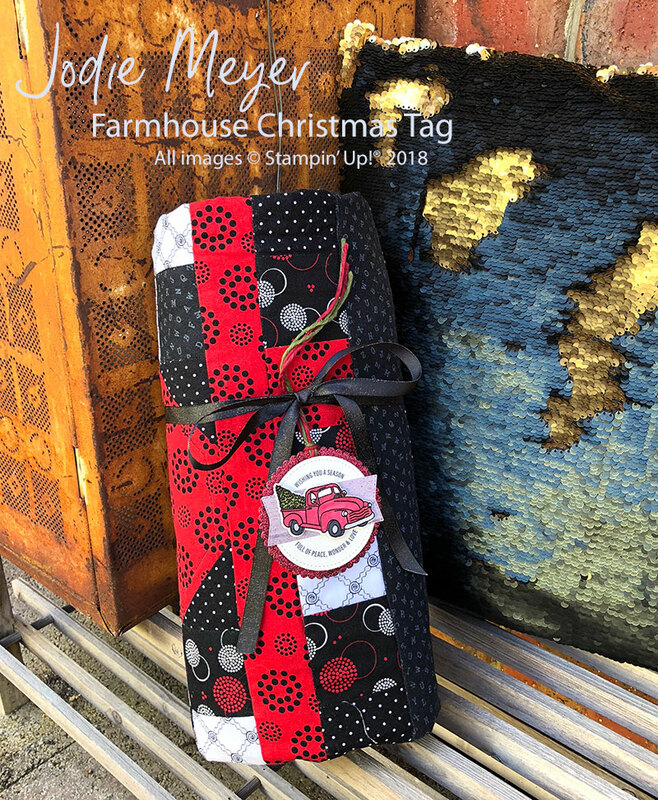 Jodie has created a gift tag using the Farmhouse Christmas Bundle, which is the same bundle I used to create the gift bag in my Stamping Sunday Tutorial. 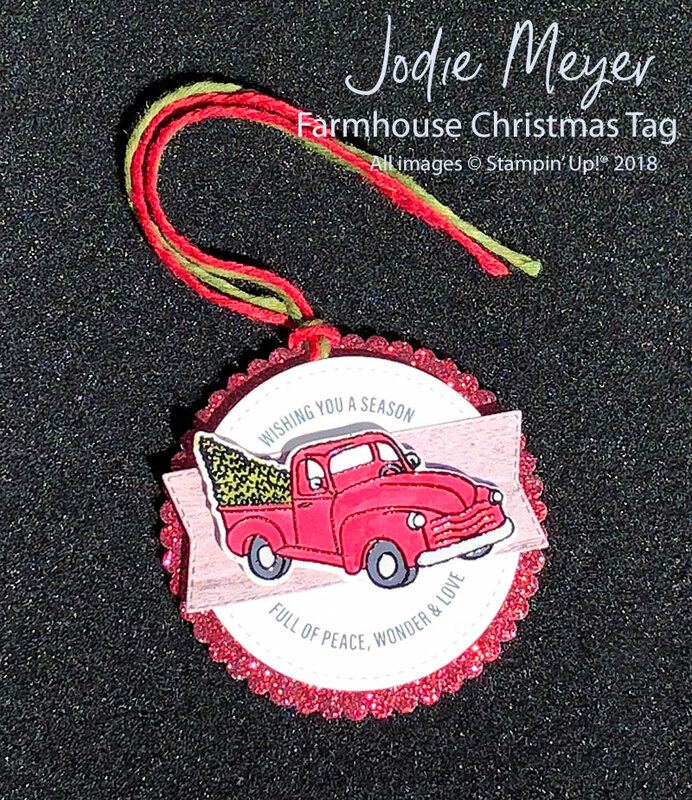 Jodie has used the Truck & Christmas Tree image as her feature, stamped and coloured with Cherry Cobbler, Old Olive, Basic Black and Smoky Slate Stampin’ Blends and then die cut with the co-ordinating die. How lovely does this tag look wrapped around this quilted gift? Jodie has mounted her “ute” onto the stitched flagged banner shape from the Farmhouse Framelits Dies, die cut from the Wood Textures Designer Series Paper. The words that fit in to that Stitched Circle Framelit also include a large “Merry Christmas”, which is covered over by the stitched banner. All of which is layered over a scalloped circle die cut from the Layering Circle Framelits out of the delicious Red Glimmer Paper. 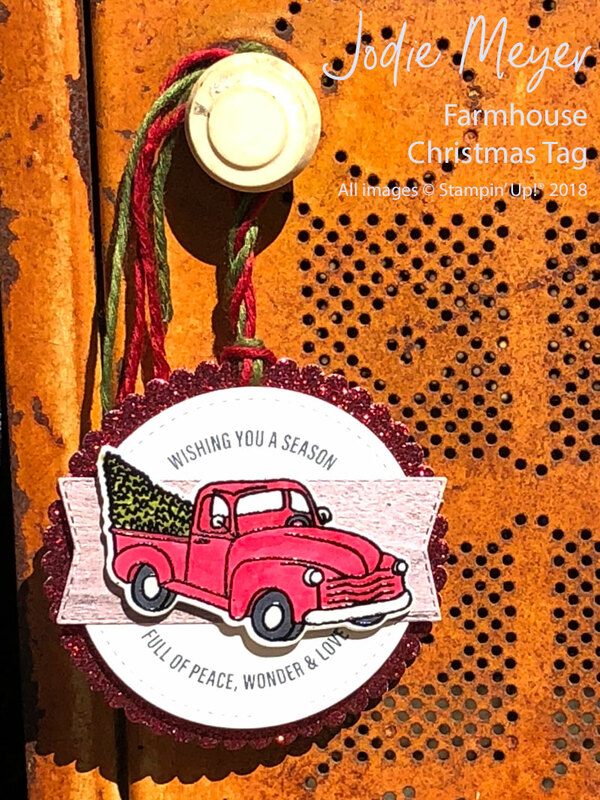 The Festive Farmhouse Cotton Twine in Cherry Cobbler and Mossy Meadow finishes off the tag nicely. Sharryn has created a delightful tag using the First Frost bundle. 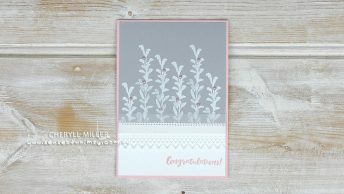 Sharryn has used the fabulous Corrugated Textured Impressions Embossing Folder and Soft Seafoam cardstock to create her card base. The next tag layer is also cut from Soft Seafoam. The flower is stamped in Lovely Lipstick and the leaf sprigs are die cut from Soft Seafoam and Gold Foil. 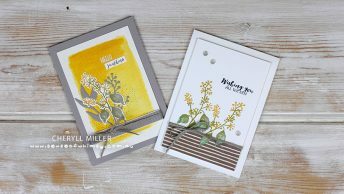 The greeting is heat embossed with Gold embossing powder on Whisper White cardstock and die cut with the smaller frame shape from the Frosted Bouquet Framelits Dies. Die cut the larger frame shape from Gold Foil Sheet. The Whisper White Polka Dot Tulle Ribbon finishes off the tag wonderfully. 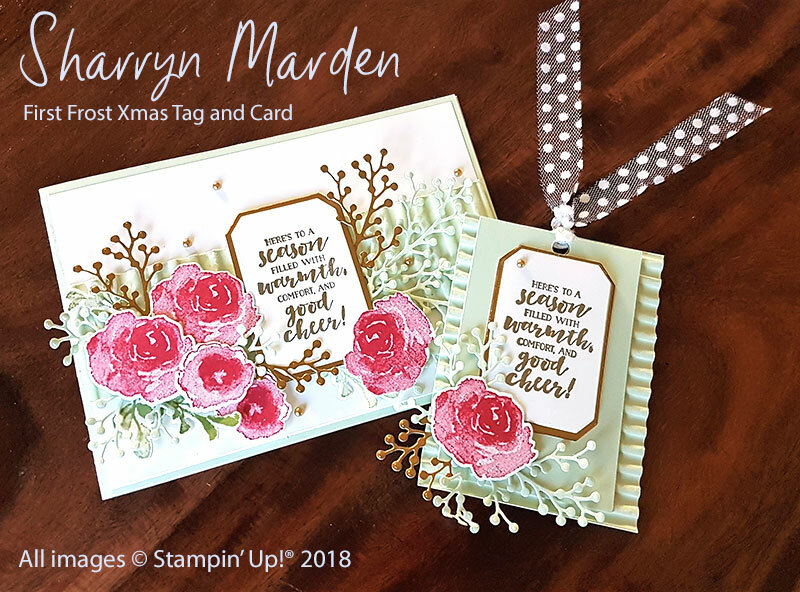 Sharryn also created a co-ordinating card for the tag …. how wonderful is this gorgeous set. My team members are amazing. I gave a shout out for help in creating the projects for this hop at short notice, and they stepped up immediately. And look at these projects! They are fantastic. Here is another image of Jodie’s tag. Next up in the hop is the fabulous Sara Levin. This is a small hop, so it will just take a few minutes to check out the projects from the very talented participants. Thank you for stopping by, help me thank Jodie and Sharryn by leaving a comment. I would be so appreciative … these two ladies are so generous and talented!